Read on to discover why this remains the yardstick against which all other hidden movement games are measured and fall short. Be warned though: hidden below are a range of British terms for the police. Can you find them all? There’s panic on the streets of London. A notorious criminal is on the loose and it’s up to the dogged metropolitan police to bring them in. The coppers will have to follow every lead to track this cunning foe through London, calling to the underworld for clues and tipoffs. A foggy day in London town has led to a rainy night in Soho and the flatfoots are pounding the pavements in pursuit. Yet the gossip of the West End girls say the criminal is elsewhere and reports have come in that lately he’s been overheard in Mayfair. Perhaps the wrong’un has headed south of the river to collect the guns of Brixton conspirators. One thing’s for sure, the bizzies will be ready when they catch up, ‘cause in sleepy London town there’s just no place for a street fighting man. Unless of course the criminal manages to slip the bobbies’ pursuit and walk off into a Waterloo sunset. There are a lot of songs about London. 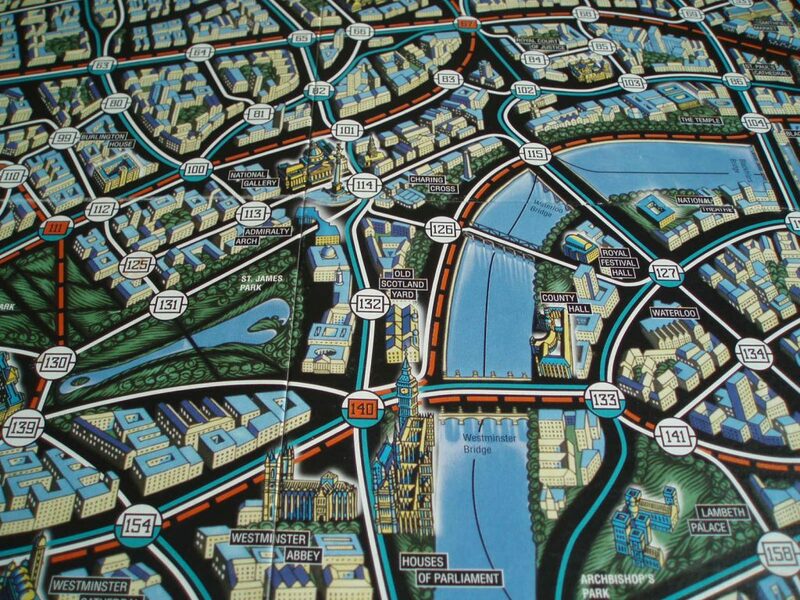 There are a lot of board games set in London too. A disproportionate number of them involve hidden movement – one or more players moving secretly around the board whilst others travel around the board trying to track them down. It’s a brilliant mechanic, so visually intuitive with one team’s pieces on a map searching for a pawn that exists only in the hidden player’s imagination. If you’re the hunter you get to piece together your prey’s movements, picking up clues and gradually closing the net around them. If you are the hunted you get to outwit your opponents, dancing around their fumbling pursuit and feeling like the smartest person in the room. Hidden movement games are a deliciously zero-sum experience, you win or you lose and there’s nothing in between. And Scotland Yard is the chief commissioner and Moriarty of them all. Old Scotland Yard: The original headquarters of the Metropolitan police and an apt description of this game. Players are either inspectors of the Metropolitan police or a nefarious criminal known only as Mr. X (happily there’s absolutely nothing in the game itself stopping you from being Ms. X, Miss X, Mrs. X, or for that matter Dr., Dame or Lord High Chamberlin X). 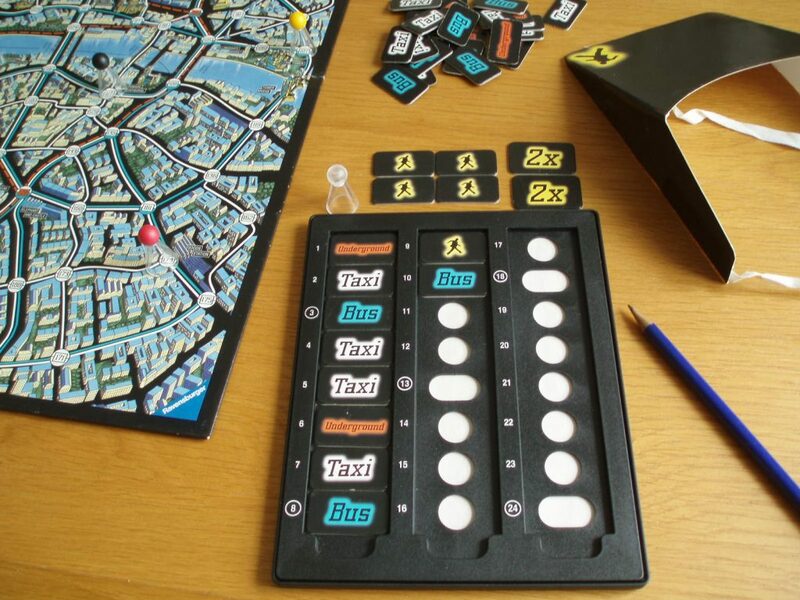 Roles assigned, London splays out before you with the various locations connected via a network of white taxi, blue bus and red underground links (later editions also include boat links for Mr. X but I’m working from a 1996 edition when presumably river travel was too extravagant). 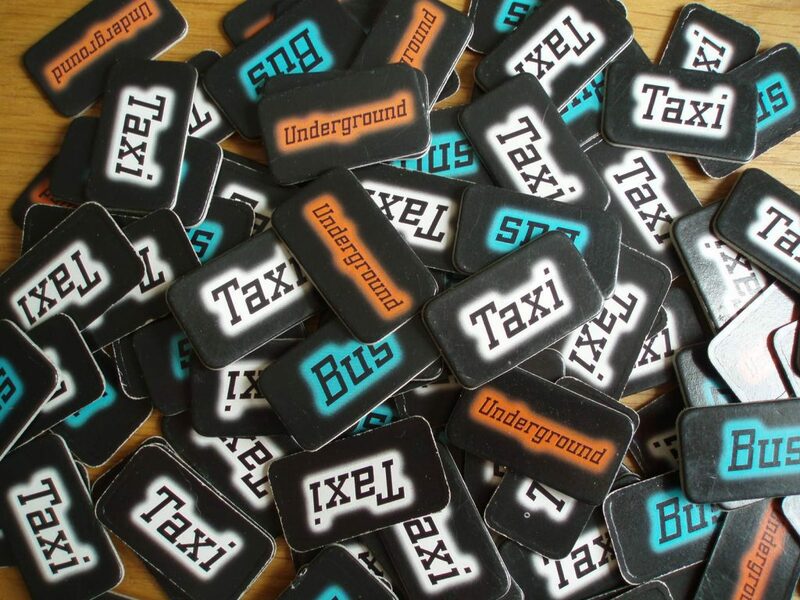 The plentiful taxi routes may be better for travelling anonymously but they don’t get you very far, whereas the underground covers long distances but stops are few and far between making Mr. X easier to locate. Due to civil service budget cuts the bronze have a limited supply of each ticket type whilst Mr. X has near free reign to move how they want along with a couple of double and secret move tickets to keep their pursuers on the back foot. A couple of key rules keep the thin blue line in the game. Firstly, whilst they can’t see where Mr. X is moving, the mode of transport used is almost always visible. This paper trail keeps the plodders sustained and builds on the second key rule: Mr. X is spotted at regular intervals. These sightings provide the spark that keeps the beating heart of this game pumping. The detectives never feel completely left behind as each reveal confirms a hunch or starts their puzzle afresh if they need it. On the other hand these moments of vulnerability for Mr. X ensure that the chase is always tense and require careful planning: where to position yourself and how to get away safely before the swarming inspectors catch you. Mr. X’s resources: record slate (with locations hidden by tickets), pencil, visor and special tickets. I have a recurring dream involving zombies, although in truth they’re more of an off-stage threat. We’re trying to remain hidden but sooner or later they’ll find us. It’s the crushing inevitability that scares me. The dream ends before a zombie shuffles into view, what wakes me in a cold sweat is that the situation is utterly inescapable. Being Mr. X in Scotland Yard creates a similar feeling, albeit without the undertones of dread. There’s a tension and excitement to the role that few games manage. This thrill means that most people want a turn at playing Mr. X. Everybody wants to be the wily fox, outwitting the law-enforcement equivalents of Boggis, Bunce and Bean. There’s no doubting it’s an easier role and often Mr. X is only caught because of their own mistakes. Yet these slip-ups result from the pressure of the relentless peelers, the fleeing player’s heart beating faster each time they slip past the closing trap. Ah, the satisfaction of misdirection: the police (colourful pieces) appear to have Mr. X (clear piece) cornered… and then it turns out that they don’t. At the same time, the puzzle that the gumshoes work on is utterly engaging. Each turn provides a new lead to chase up and these breadcrumbs allow the old bill to start to piece together their prey’s movements. It’s richly methodical and when you turn out to be right it’s immensely satisfying. Yes, there are occasions when it seems like the boys in blue never stood a chance but these are rare and in some ways thematically fitting. Losing as the rozz seldom feels like you’ve wasted your time, you can always point to moves and directions taken during the game as being the moment you let Mr. X slip through your fingers. Of course, these days I imagine CCTV would make tracking Mr. X a lot easier but happily this is a game from the early 1980s. 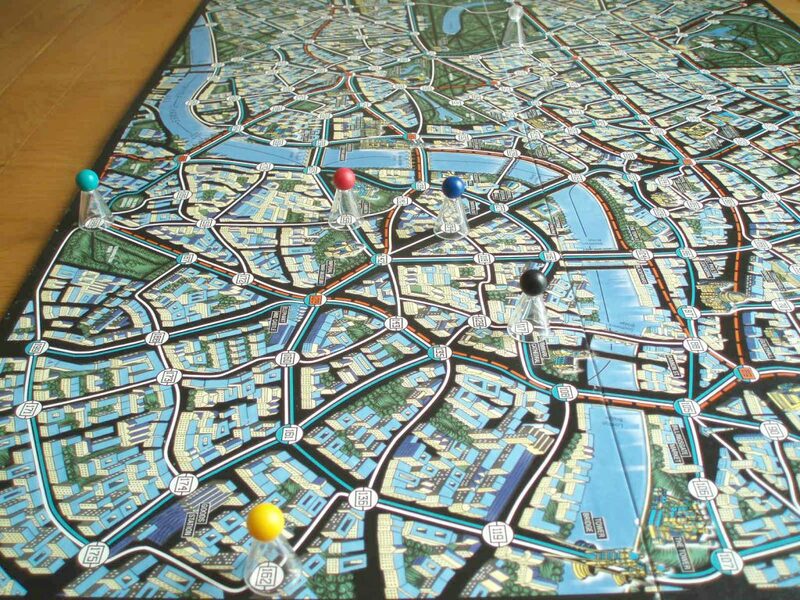 When Scotland Yard won the Spiel des Jahres I was to scale, an expanding ball of cells that could have walked the cardboard London streets if I’d had legs. My impact on the world since then has been very small (if not entirely insignificant). Yet my edition of Scotland Yard from 1996 claims to have sold 3.5 million copies. Given that you need 3 players for a game that means over 10 million people had played it at least once back then. Even with a highly conservative estimate of only half of players enjoying it that’s 5 million player hours of fun 22 years ago. By now Scotland Yard’s impact must be huge, its legacy intimidatingly vast. And that’s not counting the games that it inspired as the founder of the hidden movement genre. Those who like to keep their games in mint condition might baulk but there’s no better indication of a great game than a well-worn box. I’m not a huge fan of London. They say that all of life exists in its series of distinctive boroughs and if you’re tired of London you’re tired of life. But in Samuel Johnson’s day the concrete didn’t stretch infinitely in all directions, an unrelenting mess of lives all piled up on top of each other. It’s one of the greenest cities in the world yet the sky above your head is a series of grey buildings and the earth below your feet is gum-speckled pavements. London is too big and over-populated, too dirty, noisy and anonymous. It is, in fact, the perfect place for hiding. 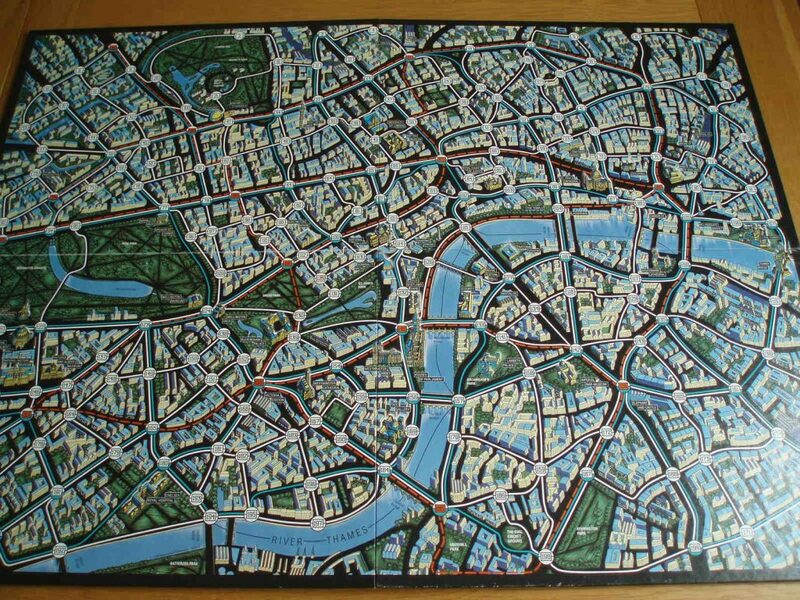 London spreads before you, a tangled mess of streets along which a criminal prowls. I think that’s why so many of Scotland Yard’s descendants are also set in London (including the recently reviewed Black Sonata), the city that created Jack the Ripper. 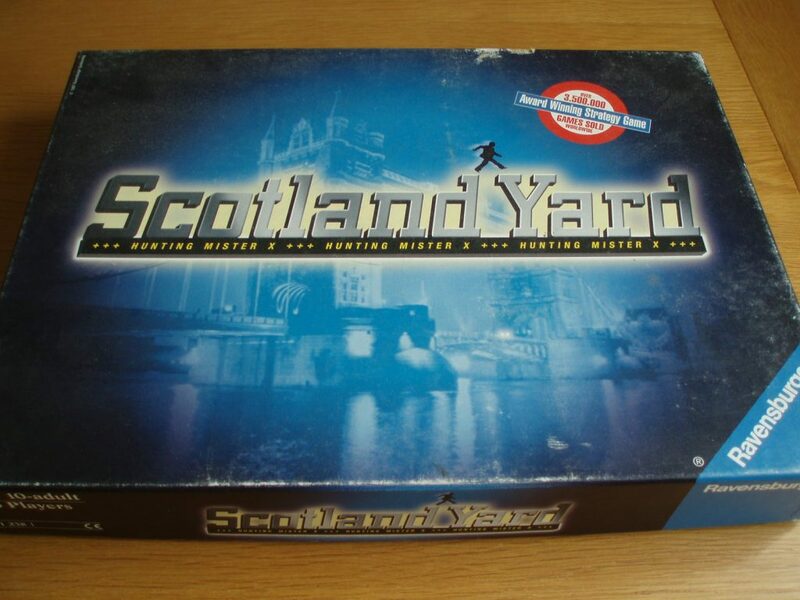 These subsequent games expand on Scotland Yard’s core recipe, inserting additional mechanics like a Michelin-starred chef adding foam, crumbs and jus to a fillet steak. Things like combat, minions, player powers and checkpoints add a smidgeon more flavour and texture, yet ultimately the dish succeeds or fails based on the quality of the meat itself. Hidden movement games provide a specific experience and these superfluous flourishes can be distracting, diluting the purity of the hunter-hunted dynamic, adding rules, time and fiddliness. Compared to its flabby offspring Scotland Yard plays in half the time, with half the rules and at half the price. It’s not perfect. With 6 players you can be waiting a while for your turn, although quick turns mean this is rare. There’s also the usual co-op risk of one of the cops dominating the strategy or dictating everyone else’s turn. And the ticket restrictions can occasionally be frustrating, although more often this is simply another layer of the fuzz’s puzzle. The one potential improvement that later games have added is a personal map for the hunted player. In Scotland Yard everything happens around the central board, so where Mr. X looks may provide information about their whereabouts. The game comes with a snazzy visor to mitigate this and a pair of sunglasses can help as well. That said, even without specs or visor I’ve never found this to be a real issue. So there we have it: Scotland Yard. A game that won the major board game award and started a genre. Subsequently it has affected millions of people around the world and has multiple editions, spin-offs and imitators. Yet it remains just as sharp a piece of design as it always has, more streamlined and straight forward than its descendants. It is hidden movement distilled, the ultimate game of cats and mouse.